When things go wrong around our homes, there are some incidents that are more bothersome to us than others. We don’t like having to take a shower in cold water, most of us anyway. We don’t like to be without water, and we don’t like being without electricity. We are very unhappy when appliances and other conveniences break down and we don’t understand why. We have over the years come to take a lot for granted, that is until we have to do without it. So what do we do when we find ourselves in need of knowing a little something about electrical troubleshooting before deciding to call a Phoenix electrician. There are some do-it-yourselfers who like to dabble in the construction trades, and there is certainly nothing wrong with this by any means. However, many things involved in construction are dangerous, and working around electricity is one of them. A licensed Phoenix electrician spends many years learning the trade, and they better than anybody know how important it is to exercise proper safety when working around electricity. So before you remove the electrical outlet cover and start investigating, here are some things you should know about electrical troubleshooting. Before you work on any electrical circuit, the power to it needs to be turned off. If you are not sure what a circuit is or how to turn power off to it, you might be better off calling a skilled electrician at Eagle Services in Phoenix, Arizona. 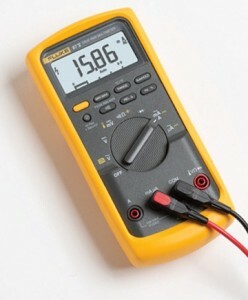 An electrical circuit tester is a handy tool to have when electrical troubleshooting. It is a good safety precaution to test the circuit before you turn the power off, and again afterward to make sure the circuit is dead. Testers are not a costly item, especially when you consider the fact they can protect you from being shocked. Some testers have a neon light bulb attached to two leads. When the leads are placed into an outlet, the bulb lights up if the circuit is on or “hot.” If the bulb doesn’t light, the circuit is dead. Another type of tester is the multi-tester, and it measures and displays amperage, ohms, and voltage. It is a good idea to test the tester, too. Check a circuit you know is working so you don’t get an unexpected “shock.” An electrician can test outlets, switches, or light fixtures when electrical troubleshooting depending on what the problem “symptoms” are. This is why a bird can sit on fence wires and go unharmed, but a dog or deer that has paws/hooves on the ground and comes in contact with the live wire, “ouch” it will hurt. If you are unsure what proper steps to take when working with electricity, give Eagle Services a call. They also offer HVAC and plumbing services, so one call does it all. Eagle Services – offering prompt professional service in the Phoenix and surrounding area of Arizona. Call today – 602-354-3648. Yes we can do that. Call our office and we can help you.